In a mixing bowl whisk together the flour, baking powder, baking soda, salt, sugar and raisins. In a mixing pitcher, mix the egg, yogurt,and buttermilk. Pour the melted butter into the liquid mix and completely mix. Stir in the golden raisins. Place the muffin papers in the muffin tins. Fill each muffin paper 3/4 full. Top with Sparkling Sugar. Bake the muffins at 400 degrees for 20 minutes and a tester comes out clean. Remove from the oven and place on a cooling rack. Remove the muffins from the tin and cool on the rack. I love to serve these with butter and Apricot Jam. I sure am glad that you could stop by and enjoy these awesome Irish Muffins with us today, we loved having you visit! Hope you have a fantastic week and come back to see us real soon! These look delicious. Is 2 cups of raisins correct? That seems like way too many. We like a raisin in every bite, so that is the measure that I used for the recipe. You could cut the raisin's back if it is to many for your family, we just like to bite into a nice raisin with the crumb. 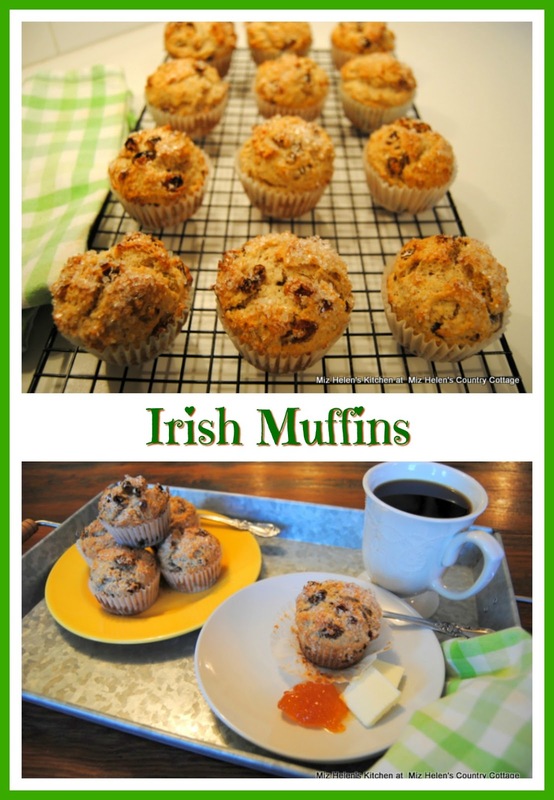 It is a great muffin and hope you enjoy it.Thanks for stopping by and hope you have a great St. Patrick's day! These look delicious, and I love a recipe that doesn’t call for heavy equipment, but can just be stirred together. Thanks for sharing, I’m going to try these. It’s been a long time since I’ve had a muffin at breakfast, and I really need to remedy that. These look so good, Miz Helen. I made Irish Soda Bread Muffins this week, and I've been enjoying them very much. Your recipe sounds wonderful, as do all your recipes! Sounds fantastic! Thanks for sharing at the What's for Dinner party. I love this take on soda bread, Miz Helen! I also love what you said about family, food and memories. It is so true. Thank you so much for sharing and for being a part of the Hearth and Soul Link Party. I hope you are having a lovely weekend!